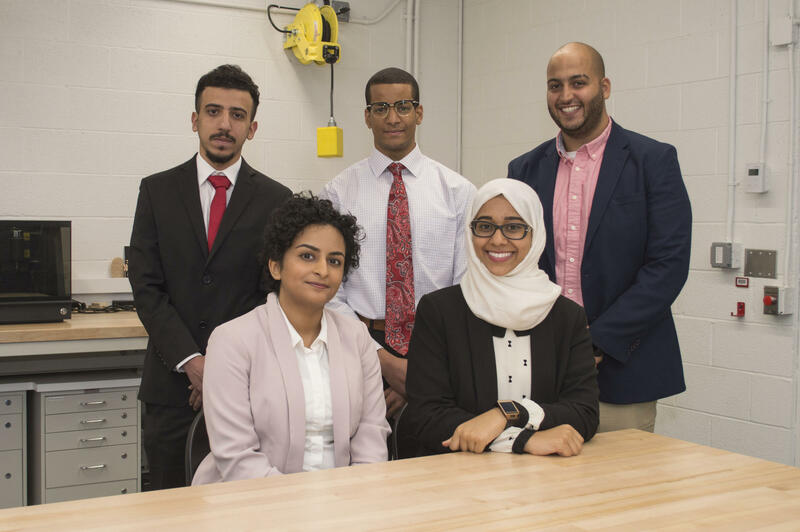 Maryam Aljanobi is one of the engineering students who created the LAT lock, which stands for Lock it, Alarm it, and Track it. She and Franzel Pena demonstrated the prototype, which sends a notification to the user’s smartphone when someone tampers with the locking device. “Everything is done through the phone, so the user has full control of the system,” Pena said. Aljanobi is from Saudi Arabia, with a double major in computer engineering and computer science. Pena, originally from the Dominican Republic, is also a computer engineer major. He said it took two semesters working most days of the week to produce the lock. The smart lock, roughly five inches long, is flat on one side and rounded on the other, with a U-shaped shackle that attaches through holes on each end of the device. It locks the gun through the magazine well and blocks the firing pin. The project was sponsored by Terry Gilbert, a gun enthusiast and hunter, originally from Orange, Connecticut. Gilbert designed and patented a lock more than 20 years ago, but he wanted an updated design using today’s technology. Gilbert’s original lock was inspired by a tragic accident. Gilbert and the UNH students are talking to various manufacturers, and hope to have the product on the market within a year.